A typographic illustration is a trendy design you may see on all sort of places. Prints, shirts, you name it! In this tutorial I will show you how to quickly make one by using the pen tool, a handwritten font and an image all in Adobe Illustrator. Excuse me but I “mustache” you a question! Did you know the hipster trend is still around? 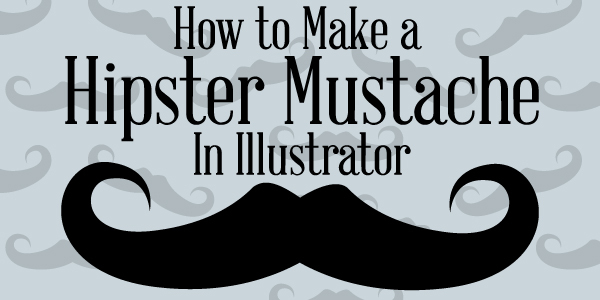 Did you know hipster mustaches are still a big deal? Well in this tutorial I will show you how to make a very quick and simple hipster mustache to go with any vintage-y design! Fireworks! The nice colorful explosions that light up the sky that bring out your inner pyromaniac! It’s a great way to celebrate! In this case we are getting ready to celebrate the new year! In this tutorial I will show you how to make simple fireworks in Illustrator using the pen tool and some gradients. With fall in full swing and Pumpkin Spice fused into every seasonal thing, it’s on everyone’s mind! Which is why I am going to show you how you can make your own pumpkin vector in Adobe Illustrator!